It doesn't matter if you are an avid sports fan or rarely turn on ESPN. It doesn't matter if you cheer for the Cavs, the Knicks, the Bulls, or the Heat. It doesn't matter if you follow the NBA or even like the sport of basketball. Last night, one man had the entire country's attention in a show that I would venture to say was in the running with the State of the Union in viewership. Last night, the number one NBA free agent was a free agent no more. In the words of Will Smith: "Welcome to Miami." Finally ending the will-he-won't-he speculation that had everyone guessing, LeBron James announced to the world that he would be joining superstars Dwayne Wade and Chris Bosh in Miami to play for the Heat (Wade and Bosh both signed on Wednesday). This announcement was made during a one-hour prime-time special aired on ESPN called "The Decision", which was unlike anything I have ever seen in sports. James was deciding between the Miami Heat, New York Knicks, Chicago Bulls, Los Angeles Clippers, New Jersey Nets, and of course, the hometown Cleveland Cavaliers. Let's start with the obvious: the rage, hatred, and disappointment emanating from the city of Cleveland. James was there for seven years and failed to break "The Cleveland Curse" by bringing home a championship. Shortly after James' announcement, there were shots all over TV of ex-fans burning #23 jerseys and other Cavalier paraphernalia. When asked about how it made him feel to see that, LeBron said "he couldn't have anything to do with that." Ouch. He also mentions that the Cleveland Curse is going to follow LeBron to Miami until he makes right with the state of Ohio. Warranted? Absolutely. Inappropriate and immature as a figurehead of a franchise? You betcha. Obviously everyone in Cleveland is thinking the same thing, but it probably wasn't the place of the majority owner to spell it out on the Cav's website, throwing James completely under the bus. While he deserted his team, he did give them seven years that the Cav's never would have had without him. I think that ignoring my (and clearly Dan Gilbert's) issues with his lack of loyalty, staying in Cleveland might have been the best career move for LeBron anyway. In my opinion, the Knicks, the Nets, and the Clippers were never legitimate choices. I think those all would have been incredibly dumb moves for various reasons, but I don't care enough about any of those franchises to get into why. I know a lot of people wanted to see him in Chicago, and here's why I'm glad he didn't go there. He has endlessly compared himself to the great Michael Jordan, and by his actions last night, it is apparent he can't even touch the man on so many levels. Just because he wears #23 like Michael doesn't mean that they're comparable beyond basketball talent. Last time I checked, Michael never referred to himself as "Air Jordan". Sure the guy's got game, no one can deny that. And I'll give him that "no one can live with the decisions he makes besides him." But let's be real: James playing for the Miami Heat was a cop-out decision. He's joining forces with two of the greatest basketball players out there right now and the "dream team" is probably going to win championships. But you don't really win championships by playing with the best of the best. You win them by beating the best of the best. After seven years, he couldn't get a ring on his own, so he joined the most stacked team around and is hoping it sticks. Granted, James didn't have all that much help from his team in Cleveland, but I think a win in Cleveland would somehow seem more authentic than a superpower of Olympic gold-medalists rocking the Eastern Conference. Another reason I don't really believe the move to Miami was LeBron's smartest move was all in the numbers. Wade, Bosh, and James all have points-per-game averages above 25. That's obviously not going to stand with all three of them on the court at the same time. When there are 2 seconds left on the clock and it's a game time decision, who gets the ball now? When they were all on separate teams, it was no question. Who is going to give up their superstar status now that they're all on the roster? I can't imagine we are going to be able to see the same Dwayne Wade, the same Chris Bosh, and the same LeBron James play basketball the way we have for the last seven years. 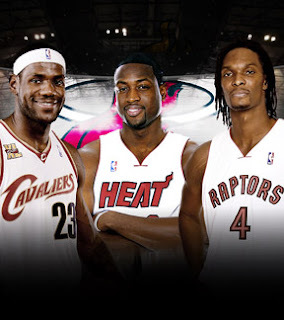 Having three superstars playing alongside each other is clearly great in theory, but it drastically changes the name of the game for them, the Miami Heat, and NBA basketball in general. When they win, we'll think "how could they not with the dream team"? When they lose a game, it will be picked apart and over-analyzed to death. Not to mention, with the amount of money they needed to pull these three in, they are still eight guys short of a full-roster, as they are now required to hire at-minimum to stay within their budget. As an ESPN writer said yesterday, Cleveland can now add "The Decision" to their list of sports catastrophes that include "The Shot", "The Fumble", "The Drive", and "The Move". I suppose only time will tell if this move will actually benefit LeBron and if he will be able to adjust to not being the sole superstar anymore. The heat is on. P.S. Good move, Tom Izzo.